Super Speed Racer is an interesting racing game developed by Studd Games. This game has unique 3D graphics, suitable for all ages. You can experience this game on your browser because it is a flash game. This game has 2 modes for you: Single Player and Multi Player. In Single Player, you will play against the computer. In Multi Player, you will play against other online players around the world. 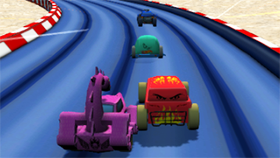 In the race, you will control your car and try to run to the destination in the fastest time. The most dangerous obstacles are the trucks running in the opposite direction. You have to dodge them and even your opponent's cars. On the track there are also special items such as items that give you speed or items that create smoke to block your view. The interesting thing about this game is that you will be given 7 supercars, such as Vortex, Vulcan, Leopard, Pheonix ... There are a total of 6 races for you to test these super cars. In addition, the game also features Achievements with 8 challenges waiting for you to conquer.